We needed time to see how big an asterisk this Australia vs India Test series deserved to be marked with in the history books. Nearly halfway through the battle, we know. An appropriately large one, whichever team prevails. In the absence of banned superstars Steve Smith and David Warner, Australia has pitched a sub-standard batting line-up against an Indian order headlined by modern greats Virat Kohli and Cheteshwar Pujara. 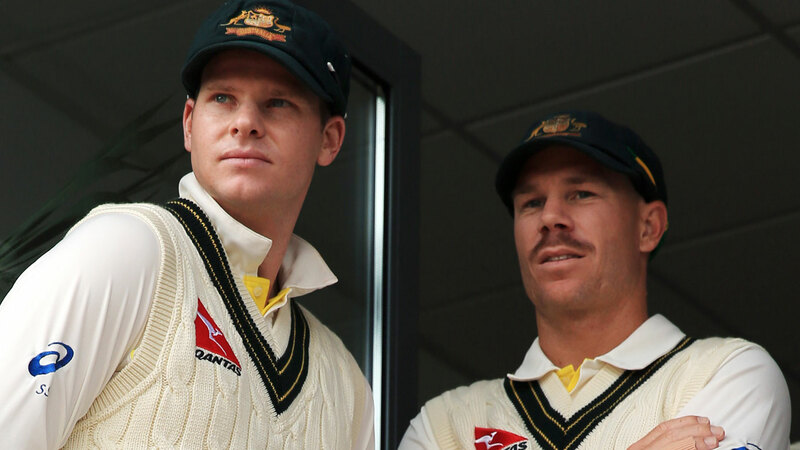 Everyone knew that Smith and Warner would leave a big hole; it has proven vast. Ask yourself: How much genuine respect would India give an Australian Test series win on the subcontinent if the home side was somehow without Kohli and Pujara? While the Indian maestros already boast centuries in this Australian series, the Aussie batsmen have been historically poor. Not since the summer of 1984-85, when Australia faced a fearsome West Indies pace quartet of Malcolm Marshall, Joel Garner, Michael Holding and Courtney Walsh, have the Aussies started a home summer without a batsman reaching 90 in the first two Tests. 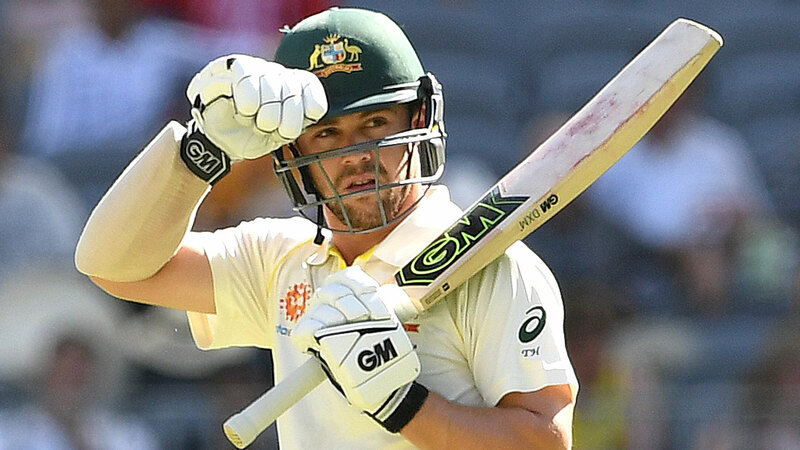 Travis Head currently owns the best Australian score this series with 72, and is the only home batsman averaging more than 40 (barely, at 40.75). After the second Test of that Windies series, 34 years ago, Australian captain Kim Hughes resigned in tears. This summer, minus Warner and Smith and with Usman Khawaja slow to find form, the lack of big scores is no great surprise. Only five times since 1984-85 has Australia not had a century-maker in the first two home Tests. The last occurrence was in 2016-17 against South Africa, when Australia was all-out for 85 in the first innings at Hobart – its lowest Test total at home since 1984. After the Bellerive Oval massacre, five players were dropped. Adam Voges had his Test career ended with an average of 61.87, exactly a year after he made 269 not out on the same ground against the West Indies. Callum Ferguson and Joe Mennie were condemned to remain forever stranded on one Test. Joe Burns and Peter Nevill were sent into exile just as they hoped for long-term incumbency. This time, it’s merely confirmation that Australia is a mediocre batting side without Smith and Warner; missing through Cricket Australia-imposed suspensions that in the eyes of many, were far too harsh. In one swoop, those lengthy bans weakened this team to an extent not seen for more than three decades. The man who loomed as a saviour after Hobart, Peter Handscomb, is in grave danger of being dropped again. Shaun Marsh continues to frustrate. Marcus Harris has shown class without a big return, as has Head; inexplicably caught twice at third man in Perth. Aaron Finch has been about as you’d expect from a 32-year-old with a first-class average of 35.93. Australian fans have witnessed an honest scrap from this lot, having been treated to the Bradmanesque performances of Smith in recent home summers. “A lot of those top-order batsmen actually haven't been belting the ball, but we've seen that when people get opportunities at the top level, they can make useful contributions,” former Australian captain Mark Taylor told Wide World Of Sports. India has brought arguably its best-ever pace attack to combat the weakened Aussies, plus top spinners Ravi Ashwin and Ravi Jadeja, with 527 Test wickets between them. Aussie spearhead Mitchell Starc has faced calls for his axing while bowling to Kohli and company, though Josh Hazlewood, Pat Cummins and Nathan Lyon have fronted with excellent form. To that asterisk. Should India win, the absence of Smith and Warner is a major dampener, even for such a historic achievement. Should Australia win, to have done so without their two best batsmen and a motley crew in their place, it would be a monumental triumph. Kohli will either claim a victory that was there for the taking, or be left to rue an enormous missed opportunity. This trip Down Under is not quite a lose-lose situation for captain Kohli, but it’s close. While that’s an extraordinary statement to make given that India has never won a Test series in Australia, the facts speak for themselves. In losing Smith and Warner, the Aussies lost players who are still ranked No.3 and No.6 respectively on the ICC Test batting rankings. They boast a combined 138 Tests in experience, 12,562 runs, 44 centuries and 53 half-centuries. Warner (6,363 runs) has made more Test runs than Australia’s current top six batsmen combined (6,322), while Smith (6,199) isn’t far off. Of the current Aussie top six, only Khawaja and Marsh boast a first-class average in the 40s; the basic pass mark for a Test-class player, or at least it used to be. Smith averages 61.37 in Test cricket, Warner 48.20. In Australia, they average 77.25 and 59.64 respectively. Kohli (53.96 Test average) and Pujara (50.48) are No.1 and No.4 respectively on the ICC Test batting rankings, though India then has a drop-off to Ajinkya Rahane at No.18 (Khawaja is No.13). After a somewhat subdued start in Adelaide, Kohli has been back to his usual brand of overt aggression in Perth. While his passion is admirable, he has teetered on the brink of going too far, according to moderate Australian voices such as Taylor and Mike Hussey. His combativeness is that of a man back in form, one who knows that he has history within his grasp with a 1-0 lead over Australia on home turf. His swagger is not welcomed by Australian fans, though it’s a near reflection of many of their own favourite cricketers, and few will rush to give him his due. The Indian captain is bellowing for a result while circumstances are stacked heavily in his favour, with Smith and Warner watching on TV. How will history judge an Indian victory, should Kohli triumph? With a sizeable grain of salt, after what we’ve seen from Smith and Warner’s replacements. Handscomb especially has not looked the part in this series. His average has just dipped back to 39 in Test cricket, and is only that high thanks to his extraordinary start against South Africa and Pakistan in the summer of 2016-17. Despite apparent tweaks to his home-spun technique, which sees him take guard incredibly deep in the crease, it has let him down against India and he will be lucky to survive for the Boxing Day Test; though he may, given a dearth of replacement options. After an awful LBW dismissal to Ishant Sharma in the second innings in Perth, fellow Victorian Shane Warne called for Handcsomb to be dropped, branding him a lamb to the slaughter. Taylor also fears that the right-hander faces a significant challenge to keep his Test career alive without major changes to his game. “I think his technique is flawed, there's no doubt about that,” Taylor told Wide World Of Sports. “I think against quality bowling, he's going to struggle with that technique. At Shield level, he probably doesn't get exposed as much as you do at the international level. Someone like India, who are a very good cricket side, can keep the pressure on for a long period of time. “When you're back and across that far, you're susceptible to LBW as we saw today, but also he likes to score a lot of his runs through point and a number of times this series, we've seen him caught in that second slip/gully area. Despite its batting shortcomings, Australia has its nose of front to level the series 1-1 in Perth. 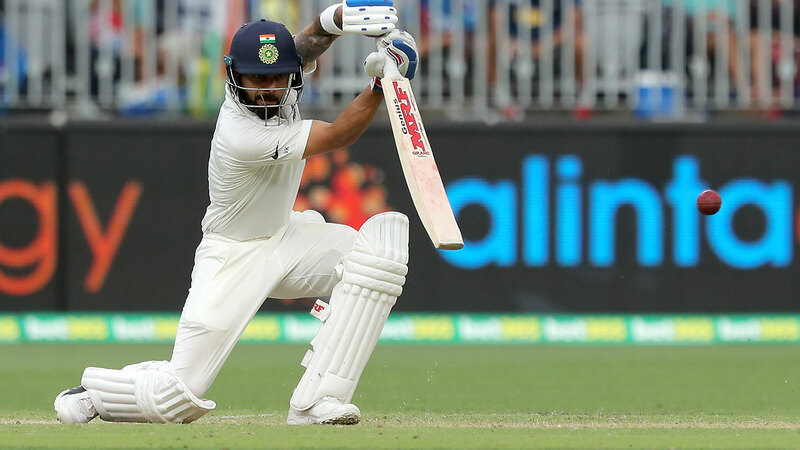 Another Kohli batting masterclass may render the fourth-innings target irrelevant and make it 2-0 India, a near-insurmountable lead with matches to come in Melbourne and Sydney. Kohli looks set to produce another bumper series with the bat, further enhancing his lofty reputation. Having made a sublime century on a Perth greentop against Starc, Hazlewood, Cummins and Lyon, the plaudits are entirely justified. He now has as many Test centuries in Australia as Sachin Tendulkar (six). But if he hoped for a signature moment in his captaincy by claiming India’s first series win in Australia, he may be left holding a booby prize 34 years in the making.